Presenting a periodic overview of the most significant developments and trends in the field of social security has become, for the International Social Security Association, a tradition and a firm commitment. Benefiting from the vast quantity of information uniquely available to the ISSA, its triennial review takes stock of the current state of social security world wide and focuses, through expert analyses, on some of the most pressing social security issues. 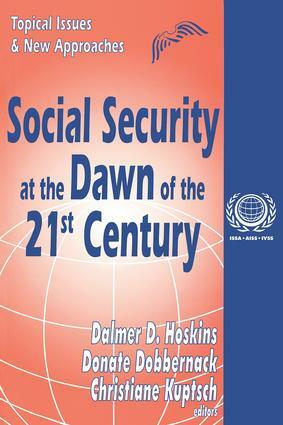 Social Security at the Dawn of the 21st Century, the outcome of the most recent review, is intended to significantly extend the access of an international readership to accurate and up-to-date information and analyses on social security, which has without question developed during the twentieth century into one of the most important publicly financed and administered institutions in modern society. The chapters are grouped into two parts. Part one treats subjects related to policy trends and regional developments, with special emphasis on such important issues as redesigning social security programs, new management practices, and the informal care dilemma. It features major aspects of developments in Asia-Pacific and Latin America. Part two focuses on specific program areas, with special emphasis on problems and reforms in employment policy, pension systems, and public disability schemes. Information is also provided on new approaches to ensuring adequate access to health care and on policies in response to changes in family structures as well as an recent experience with social assistance programs.